I feel like I can finally say Happy Fall, and not fear the backlash of summer trying to hang on just a bit longer with 80+ degree weather. I am so ready to pull out the cozy cardigans and go homebody status until the leaves change color. 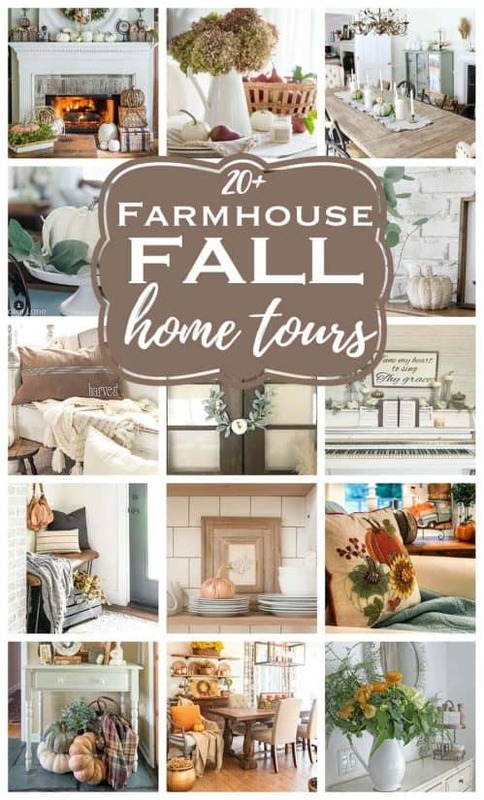 It has been a long time since I have joined my blogging friends so I am so excited for Fall Home Tours 2018! Be sure to check out all of their lovely Fall inspiration at the bottom of this post. We are smack dab in the middle of a living room makeover and finishing the kitchen, but Fall is the season of change and decorating is fun. Perfection is overrated and I know that we always have several projects going on anyhow. While I am waiting on the new furniture, this also a great time to show some of the sneak peeks to the changes we are making. Truth be told, I have never decorated for Fall before. Although Fall is my very favorite season, between getting ready for back-to-school, and then decorating for Halloween, Thanksgiving, and Christmas, it’s just too much. 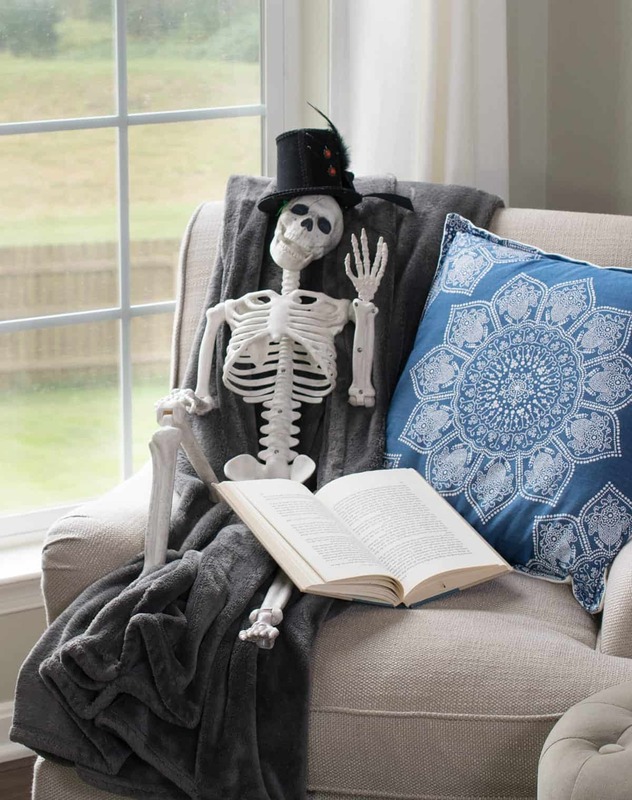 I can’t redecorate every month, so I am mixing Fall and Halloween decor. Easy-Peasy and I get to enjoy both longer! 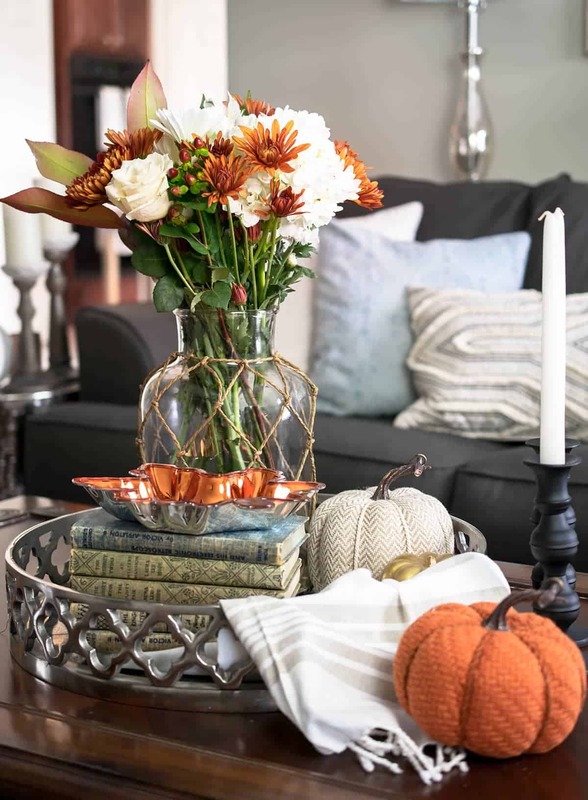 Fresh greenery mixed with items you already have is one of the best ways to add some fall decor. Although I love seeing all those instagram shots of towers of decorative pumpkins, I am a budget minded girl. (How do they afford that?!) 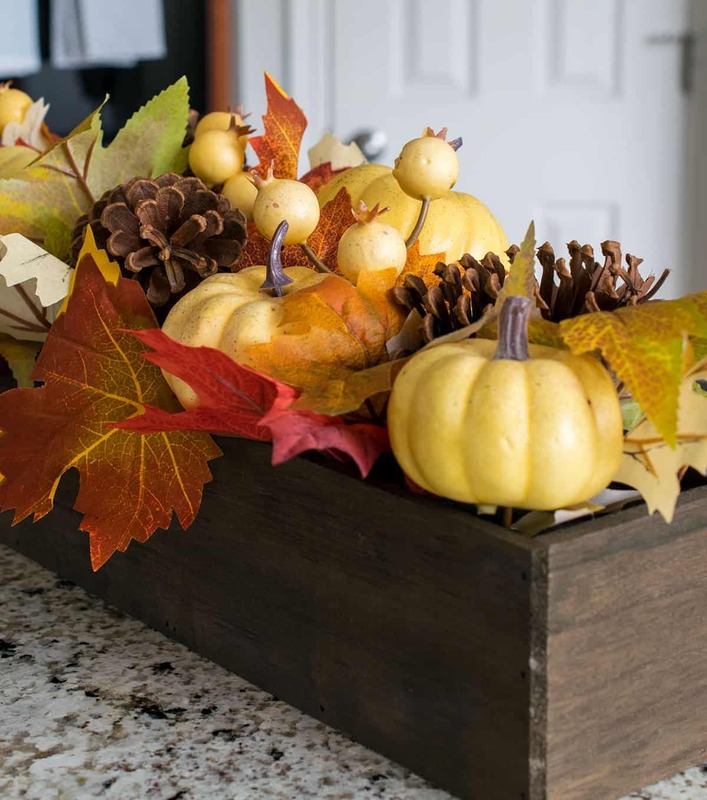 Mums are easy to care for and last all season, but also shopping your back yard for pine cones, acorns, and even logs are also fabulous budget ideas to incorporate natural fall accents. For the coffee table, I re-purposed some items I already had like books and the vase (which is actually a table lamp base). I added some Target Dollar section Pumpkins and a Dollar Store Leaf for fall effect. A batch of grocery store flowers added some pop.One of the most versatile decorating items is plain white candles in all shapes and sizes. They can be spooky for Halloween, magical for Christmas, and even romantic for Valentine’s Day. I’m a fan of spooky and frightening, but nothing too macabre. My Edgar Allen Poe inspired mantle from last year made another appearance with a few changes. I kept the original symbols: The Clock from the Masque of the Red Death, the infamous raven, and books. I am still on the hunt for a few items, but this year I added some pumpkins and the lanterns for festive pops of orange. Decorating this year made me realize an idea for the mantle and we are planning a makeover soon. Meet Charlie the skeleton. He enjoys dancing, reading, and being a tricky-trickster to ill-behaved children. Watch out for Charlie! 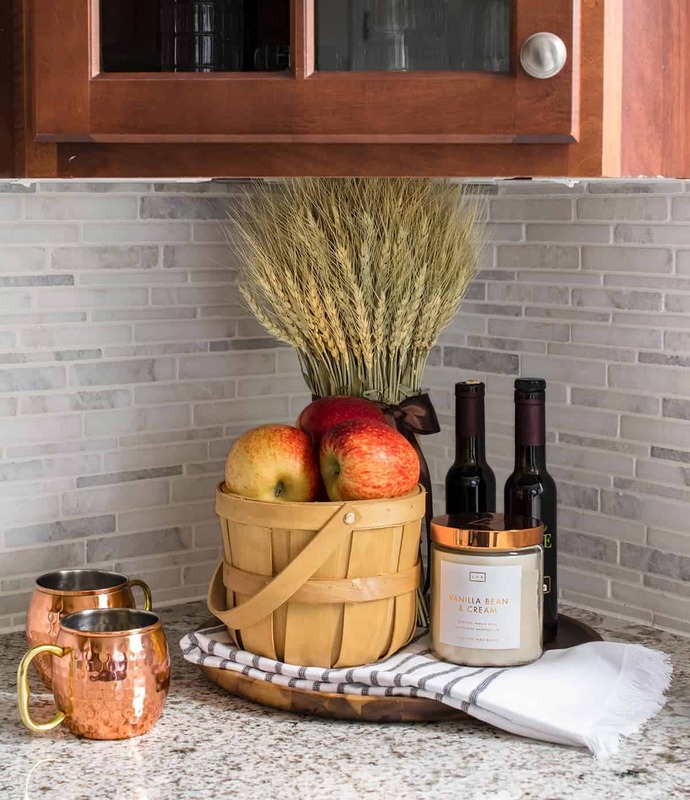 An easy place to add fall color is the kitchen. Mix in what you already have with some fresh food finds of the season. Mini-pumpkins, apples, artichokes, pears, squashes and gourds, and berries work great with a wide range of color schemes. The kitchen is subtle but festive and simple ideas are the best! Plus, my family eats apples almost every day, so these will be gone in no time. Welp, back to work for me! I’ve got a deck to stain and mulch, a fireplace to makeover, fence repairs, and a laundry list of chores that I am avoiding. Really though, I just want to curl up with a good book and some warm chai. Now that I have shared my Fall-oween Home, be sure to check out all the fabulous fall inspiration from these talented bloggers! Fall-oween! I love that!! Everything looks amazing! I can hardly believe you’ve never decorated for fall before! I hope you do it and share again because it’s beautiful. Love that you’ve mixed it with Halloween too. Festive and fun! Awww, thank you! I am sure to do it again, especially with the new furniture arriving hopefully this week and the mantle update. The projects never end! Your mix of Fall and Halloween looks great Rachel! It’s hard to believe from your pics that you’re in the middle of a bunch of projects; your house looks great! Thank you! The sofa just arrived yesterday, and I am so excited to share the changes soon. 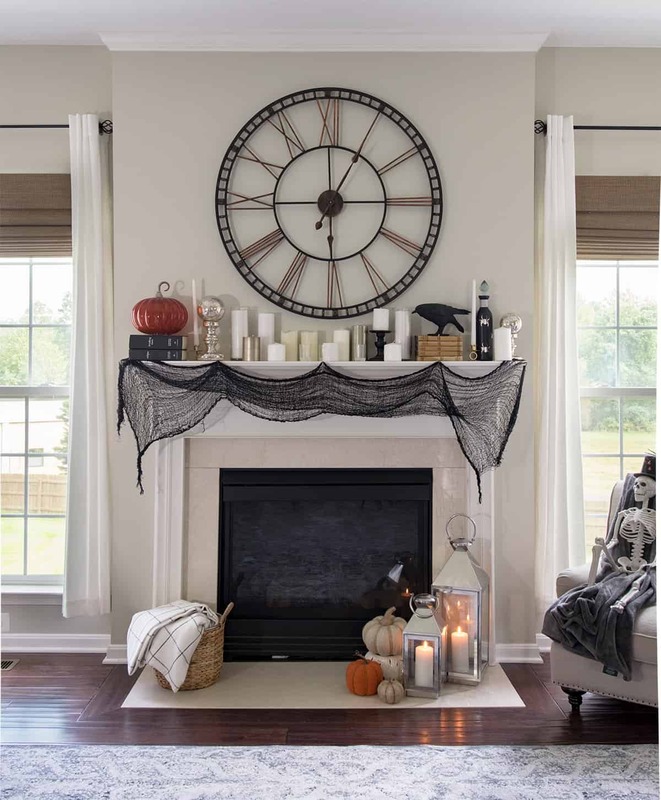 I love your home dressed for Fall-oween, Rachel! Your mantel is perfection! Love your mix of fall and Halloween!!! So pretty! Love touring with you! Love touring with you too! Your kitchen is so beautiful! Charlie the skeleton looks like he’s been a little over-served! LOL!! I love your post, Rachel! Maybe I had some wine when photographing this, just kidding. I love how playful halloween can be! Wow, Rachel, your home looks amazing! I had so much fun photographing it with you! Pinning! Your home looks so welcoming and cozy for the fall season! Thank you for sharing it with us! Everything looks so cozy Rachel! LOVE the way you’ve decorated your mantel!